Type AFD Air Filters - Airsan Corp.
Airsan Type AFD Mist Eliminators are designed for use in air handling systems that require the collection of oil mist and water droplets. 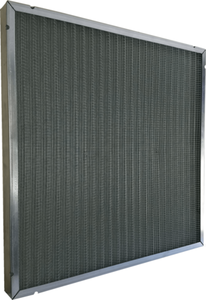 This filter is made out of galvanized steel, aluminum, and stainless steel with the customization of other material upon request. These panels are designed with drain holes on all 4 sides to allow proper drainage. The Airsan Type AFD has been used in a variety of industries such as; acid plants, fertilizer plants, steel mills, asphalt plants and large power plants. The benefits seen by utilizing the Type AFD is their excellent efficiency, modest pressure drop, low capital and operating costs. The Type AFD will catch oil mists from the ambient air, keeping the machine and surrounding areas cleaner and safer for those working in them. These filters reduce the oil mist from reaching the downstream filter. Providing longer filter life, less labor and lower replacement filter costs. In supply air, the Type AFD is effective on water droplets found on cooling coils, humidifier cooling towers and air intakes. Droplets may collect as carry over from cooling coils, evaporative media, high humidity conditions, or wet environments.